What Happened To Mary, The Mother Of Jesus, After The Crucifixion? Whatever happened to Mary, the mother of Jesus, after the crucifixion of Jesus Christ? Mary was absolutely present at the death of her Son, Jesus as Matthew records, “There were also many women there, looking on from a distance, who had followed Jesus from Galilee, ministering to him, among whom were Mary Magdalene and Mary the mother of James and Joseph and the mother of the sons of Zebedee” (Matt 27:55-56). Can we even imagine Mary’s pain as she watched Jesus’ torturous six hours on the cross? What must have that felt like only God and her know. What did she think about the three hours of darkness that covered Jerusalem when Jesus hung in agony on the cross? During the final passages in Scripture about Mary, and there are none that mention Mary after this, the Apostle John records that they were “standing by the cross of Jesus were his mother and his mother’s sister, Mary the wife of Clopas, and Mary Magdalene. When Jesus saw his mother and the disciple whom he loved standing nearby, he said to his mother, ‘Woman, behold, your son!’ Then he said to the disciple, ‘Behold, your mother!’ And from that hour the disciple took her to his own home” (John 19:25-27). There are some important points in these verses. For one thing, Jesus no longer calls Mary His mother but “woman,” which is a term of respect but also differentiates that Mary is no longer seen as Jesus’ mother but Jesus is now seen as Mary’s Savior (as He is for all of us). Also, Jesus apparently charges the young Apostle John to care for Mary since He can no longer do so. This may indicate that Jesus had been providing for her and now wants John to do the same. Jesus looked at John and said “Behold, your mother!” And from that hour the disciple took her to his own home” (John 19:27) so in effect, John would now care for Mary as he would for his own mother. The very last mention in Scripture of Mary, Jesus’ mother, comes in Acts 1:13-14 where the disciples “went up to the upper room, where they were staying, Peter and John and James and Andrew, Philip and Thomas, Bartholomew and Matthew, James the son of Alphaeus and Simon the Zealot and Judas the son of James” and “these with one accord were devoting themselves to prayer, together with the women and Mary the mother of Jesus, and his brothers” (Acts 1:14). This shows that Mary, Jesus’ mother, had joined with the disciples and was part of the early church. We don’t know how much longer she lived because the Bible just doesn’t say. There are a few Catholic Church historians that claim that Jesus appeared first to Mary and only then, to the others but this doesn’t seem to fit Scripture since there were two women that came to the tomb and found that the stone was rolled away. It would be astonishing that Mary was the first to see the resurrected Christ and the Scriptures would be silent on this. 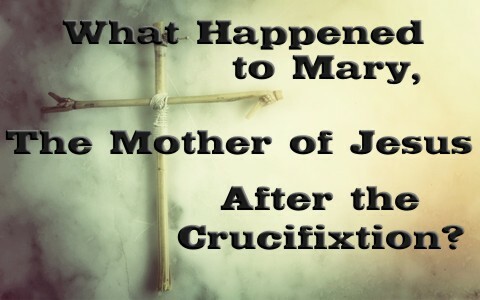 The conclusion is we just don’t know what happened to Mary after the crucifixion. We do know that she became part of the New Testament church and that the Apostle John cared for her. That is basically the extent of what we know about Mary after the cross. Other than these facts, it’s not wise to speculate or hypothesize since we could most certainly be wrong and leaving things up to human speculation is dangerous ground upon which to stand dogmatically. Whatever happened to Mary is not as important as what will happen to you if you have never trusted in Christ. If a person has been born again, they will enter the kingdom someday and they can ask Mary for themselves. Until that time comes, we can only focus on what we do know and that’s the fact that Jesus came to die for sinners and that necessarily includes each and every one of us. Thankfully, the foot of the cross is level ground. Mary had no advantages over anyone because each one who puts their faith in Christ and believes on Him will have eternal life. Then you can know what happens to you after death. If not, the Bible makes it clear what your future holds without placing your trust in Christ (Rev 20:12-15). Thank you Marion. More proof that only the Word of God is perfect. It has been corrected, That was kind of you to point that out and we thank you. Previous post: What Is The 2nd (Second) Commandment In The Bible? Next post: Why is The Mind of Christ Important to Believers?